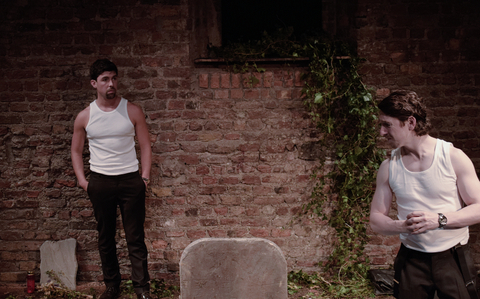 Idlewild – Smock Alley – Review by Frank L.
The set is a raised platform representing a graveyard. It is a rectangle of soil and shrubs with a few headstones and the stone wall behind of the Boys’ School. It is a lonesome space that sets the tone for what is to follow. 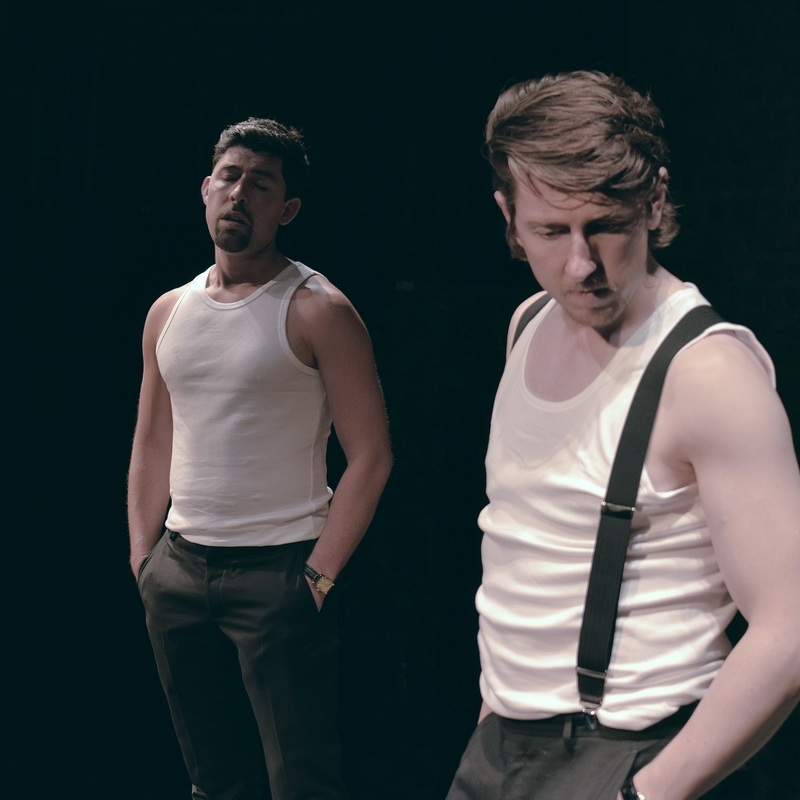 The two characters are Anthony (aka the Rev – Rex Ryan) and Donal (Ruairí Heading), two boyhood friends who have long since become ruthless foes. 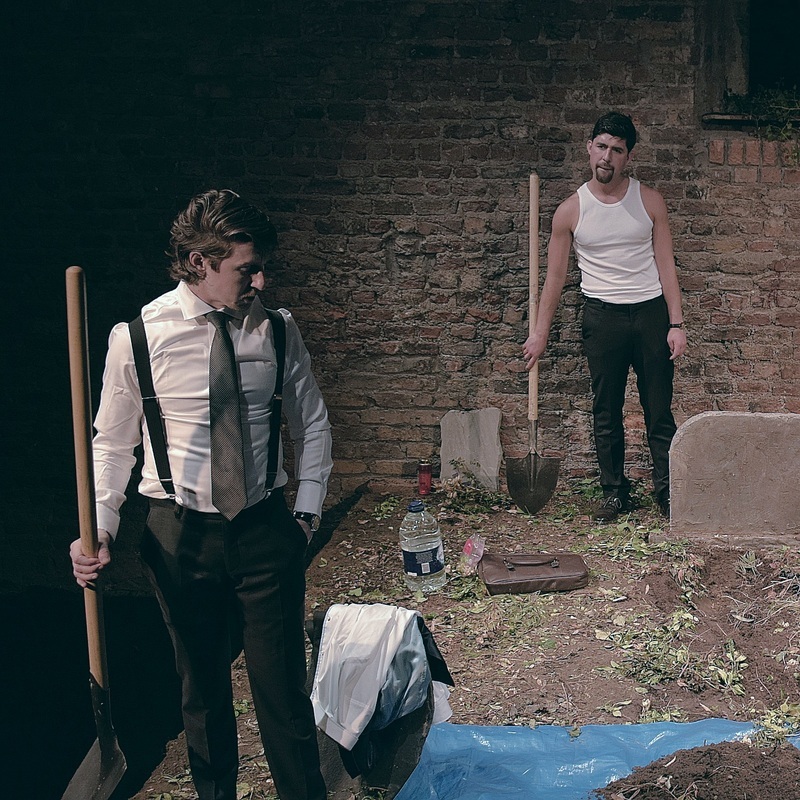 They agree to meet at the grave of a mutual friend to sort things out. The Rev is the first to arrive. From a leather satchel he produces a revolver. Donal arrives shortly afterwards with two shovels. There then follows the history of the twists and turns in their relationship and of the enterprises that each of them have pursued. Because those enterprises are not that dissimilar they have trespassed on each other’s territory with murderous consequences. The shovels are used to open the grave of Eamonn McDonagh, a childhood friend to both men. The site of his grave made a natural place for them to meet. As they tell their respective stories they dig. They create a rectangular hole. They do so slowly patting the spoil into a tidy linear mound. The methodical discipline of the work mirrors the assiduous planning required by a drug baron to move illicit drugs from the initial source to the end user. A glimpse of this planning is revealed but for the most part their stories are of their foibles, their hopes and their fears. The play is produced by Glass Mask Theatre Company, which is Ryan’s brainchild, which raised the money for the set by means of Fundit. The money has been well spent as the activity of digging acts like a mediator to bring the Rev and Donal suspiciously together. The play lasts almost an hour and a half. Given that Ryan and Heading are playing characters who in reality would be older than they are it is a test of their acting skills. Neither leaves the stage for the duration of the play. While the ins and outs of their stories are at times a little hard to follow, the constant digging keeps the audience wondering what precisely have they planned for this carefully arranged meeting. The rhythm of the digging allows Ryan and Heading to reminisce in a natural and an almost casual way. Needless to say there are similarities in their stories to the drug feuds which are part of the daily news reportage and inevitably the most well-publicised case, the Hutch/Kinahan feud, will come to mind. The world of crime and gangsters is often used on stage but this does have something new to say about the complicity of the middle classes. While the piece is more or less devoid of humour (save for the nicknames of gangland bosses) it holds the attention as the very different morality of this alternative world is expounded and the seriousness of their digging activity is made clear by the size of the hole which they are jointly creating.